Since 1999, the Borj Chaker open dump has been receiving Municipal Solid Waste from all the Greater Tunis area. The constant mismanagement has left the inhabitants of surrounding villages in dire living conditions. The Jbel Borj Chakir dumpsite was created in 1999 and is considered to be the only controlled dumpsite for Tunis and the surrounding area. It spreads out on an area of around120 hectares which previously contained olive, almond and cereal plantations. Every day, the landfill receives between 2700 and 3000 Tons of waste . The post-revolution decision to centralize waste management has exacerbated what was already an urgent problem . For most of its lifetime, the dumpsite was managed by waste-pickers and municipalities. But facing discontent at the increase in rubbish on the streets, fields and beaches, centralized policies were adopted by the ministry of environment in the hope of a more efficient waste collection and management. According to SOS BIAA, an NGO which based in Tunis, Tunisia, founded in the summer of 2011 following the Tunisian revolution and regrouping engineers, scientists, lawyers, doctors and veterinaries , this policy lead to Borj Chakir taking most of the municipal solid waste of the Greater Tunis area . On March 1, 2009, the Borj Chakir landfill became jointly operated by the Municipal Agency for Environmental Services (AMSE) and a French group called PIZZORINO Environment (GPE). And on the 9th of June, 20011, the National Commission of Investigation on Corruption and Embezzlement (CICM) filed a complaint against GPE, accusing it of illegally securing the Waste Management of Greater Tunis. Their contract was terminated in 2013 . ECOTI, a Tunisian-Italian company won the following tender and has since been managing the landfill. The company is a joint venture between DECO Group from Italy and SOCOBAT from Tunisia. The Italian company was also accused of corruption and embezzlement in Pescara, Italy . The World Bank supported the landfill for more than two decades, and its loans were the only source of government funding for the Borj Chakir landfill. A plan for a partnership between the bank and the Tunisian National Agency for the Management of Waste (ANGED) for a de-gassing and toxin removal project, was brought to an abrupt end because of political turmoil. The project was revived in 2014, with a loan of $22 million to expand the landfill . On April 4, 2015, the Minister of Environment and Sustainable Developmenr, Nejib Derouiche, announced his intentions of expanding the landfill and disregarding the claims and the demands of the inhabitants of the nearby villages. The CEO of ANGED also stated that he’ll be looking to empty the leachate basins, reconstructing the landfill wall, and planting odor-absorbing trees in the surrounding areas. Protesters, affected by the landfill claimed that the whole waste management sector needs to be reformed and that technical adjustments won’t change much . Initially, Jbel Borj Chakir was supposed to close in the summer of 2013, when it was projected to reach full capacity. But residents of Kabouti, where plans for a new landfills were made, halted the construction and made it clear that they refuse to see a landfill built near their community . 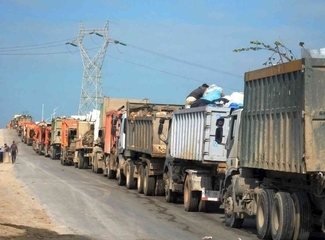 Throughout the process, activists and inhabitants of the nearby villages held many marches and protests to decry the dire conditions in which they are living because of the landfill . Moreover, SOS BIAA published multiple reports about the environmental and health damage the landfill is causing. On an environmental level, the report claims that large amounts of leachate have infiltrated the ground and contaminated the groundwater in the area within a radius of about 5 km of the landfill and that, as a result, several wells were contaminated. On the health level, they claim that skin and respiratory diseases have appeared. Diseases which are consistent with previous studies made about landfills . Most of the people affected are workers on the site and the poor communities living in its vicinity . Residents of Borj Chakir and surrounding villages have tried taking steps to force government officials to take steps to reduce pollution since the end of the revolution. They held discussions with municipal and local representatives but their efforts were poorly organized and remained without any tangible results. They were also never able to reach higher ranking government officials. SOS BIAA have set the following demands which are still awaiting execution : · The establishment of a clearly defined action plan to make the landfill conform to international standards · The establishment of a new waste management strategy that will minimize the amount of waste sent to landfills · The establishment of a timeline to get all the leachate on site treated and the ponds emptied in a short period of time. · Consider quick ways to find another site to build a new landfill. Project Details This landfill was built in 1999 over an area of approximately 120 hectares. 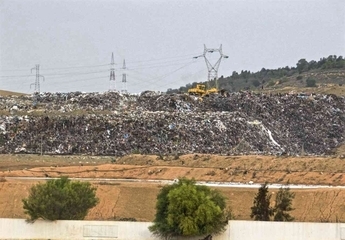 This is by far the largest landfill in Tunisia with a capacity of over 3,000 tons /day. This number could reach 4000 tons/day during the cleanliness campaigns. Jbel Borj Chakir is the only landfill in the Greater Tunis (governorates of Tunis, Manouba, Ariana and Ben Arous), for a population of over 3,000,000 inhabitants . · The establishment of a timeline to get all the leachate on site treated and the ponds emptied in a short period of time. Why? Explain briefly. Officials are still wasting time on the issue. And with the expansion of the landfill giving it a new lease of life until 2019, no alternative plans are being assessed.